Analysts were generally optimistic after companies reported results last quarter. They were, in fact, historically optimistic. We can see how unusual this is by considering some data. As companies reported their results for the final quarter of 2017, they also provided guidance on what to expect in the first quarter of 2018 and for the full year. Analysts then use this guidance to revise their earnings expectations. 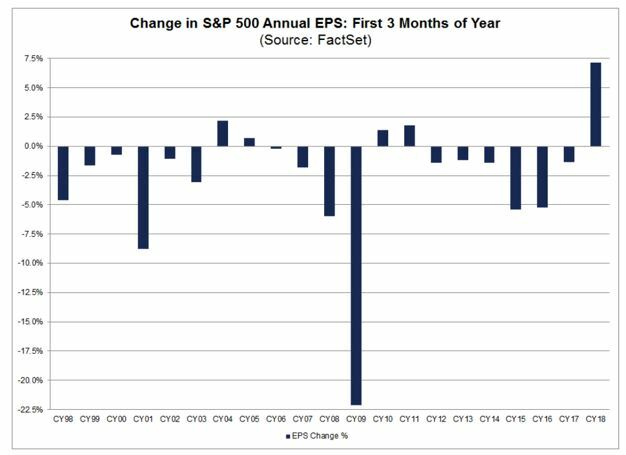 According to the research firm FactSet, analysts increased their earnings estimates for the companies in the S&P 500 to $157.77 from $147.24, the estimate they published on December 31, 2017. This is the estimated earnings per share (EPS) for the index, with the EPS of individual companies weighted to reflect their contribution to the price of the S&P 500. In addition to publishing estimates on the index, they also publish EPS estimates and ratings for individual stocks. Overall, there are 11,094 ratings on stocks in the S&P 500. Of these 11,094 ratings, 52.2% are Buy ratings, 42.9% are Hold ratings, and 4.9% are Sell ratings. In general, analysts are reluctant to use a Sell rating. It is widely believed that analysts who rate a company as a Sell can hurt their firm. This is because companies often use investment banking services and they may penalize analysts with Sell ratings. A company uses investment banking services when they complete an initial public offering. But, they also use these services when they issue or refinance debt and many companies are selling debt at any given time. Investment bankers can also help a company repurchase its own stock or handle the sell of large blocks of stock for executives looking to diversify their personal portfolios. In other words, there are a number of opportunities for Wall Street firms to generate revenue from publicly traded companies. Those opportunities could be limited if an analyst releases a negative report on a company. And, there are rare reports of companies firing analysts who issue negative reports. In one example, The New York Times reported that Merrill Lynch replaced an analyst who had annoyed Enron executives by issuing a neutral rating on the energy company. Of course, Enron collapsed into bankruptcy and the analyst was correct. For traders looking at sectors, analysts are most optimistic on the Information Technology (60%), Health Care (59%), and Energy (59%) sectors, as these three sectors have the highest percentages of Buy ratings. To gain exposure to these sectors, traders could buy exchange traded funds, or ETFs. An ETF is a diversified basket of stocks that tracks an index. ETFs trade like stocks and carry low expenses, making them attractive for investors seeking to invest in indexes. In this case, there are indexes associated with these three sectors and specific ETFs tracking the sectors with the most buy rating. Traders could buy Technology Select Sector SPDR ETF (NYSE: XLK), Health Care Select Sector SPDR ETF (NYSE: XLV) and Energy Select Sector SPDR ETF (NYSE: XLE), for example. Traders interested in following analysts’ recommendations should the Telecom Services and Utilities sectors. 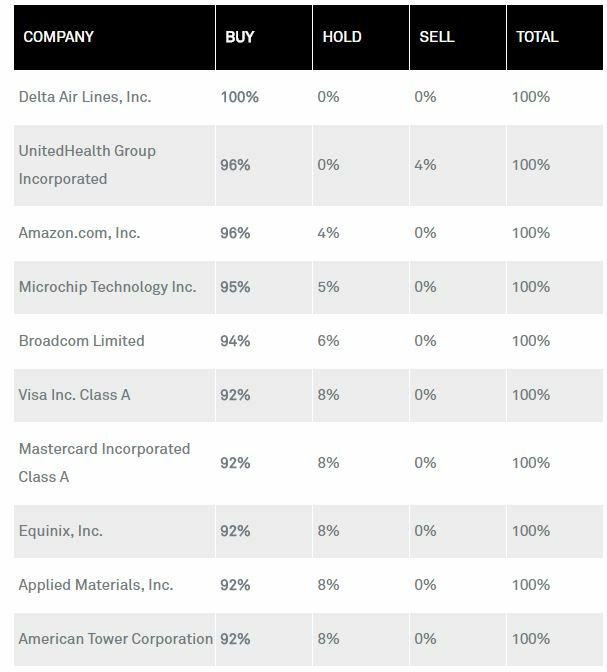 These are the two sectors that have the lowest percentages of Buy ratings. The Telecom Services sector has just 33% recommended buys and also has the highest percentage of Hold ratings, at 66%. The Utilities sector has just 39% buy recommendations and also has the highest percentage of Sell ratings with 9%. 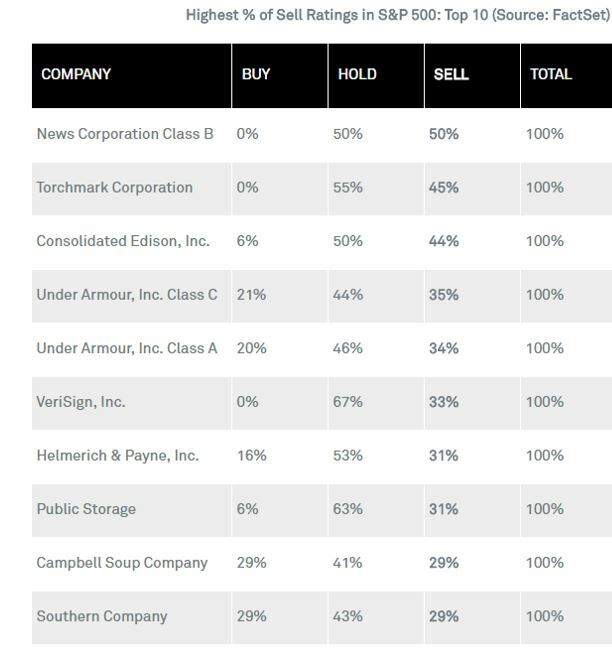 At the company level, the 10 stocks in the S&P 500 with the highest percentages of Buy ratings are shown in the next table. Now, turning to stocks to avoid, at the company level, the 10 stocks in the S&P 500 with the highest percentages of Sell ratings are shown below. The list of stocks with a large number of sell ratings could be of particular interest to traders. Although it is rare, remember that analysts can see negative impacts to their careers for bearish reports. This means analysts will generally have a high degree of conviction on Sell ratings. However, the Hold ratings should also be considered when evaluating a company. Hold is often an indication of bearishness. As we saw above, Sell ratings make up about 5% of all ratings. This indicates the Hold rating also carries a negative tone. In the table above, there are three companies with no Buy ratings. These stocks are unlikely to be winners in the coming year and traders could benefit from that. To benefit from a down trend, a trader could sell a stock short. A short trade gains in value as the price of the stock declines. However, short trades are expensive and carry a high degree of risk. Many traders avoid short selling because the risks are so high. However, traders could use a put option to obtain the benefits of a short trade. By buying a put option, the trader could benefit from a decline. The put carries limited risk. When buying an option a trader can never lose more than they originally paid to enter the trade. Put options on the stocks with no buy ratings could be profitable trades in the coming months. This is especially true if stocks continue to decline as they have in the past few weeks. In a declining market, the weakest stocks, or the biggest losers, are likely to be companies with fundamentals that cause concern. The three companies with no buy ratings, for example, are all growing slower than their industry peers, a warning sign that if a recession occurs these could be the companies that suffer more than average. Even without a recession, traders should be concerned with the possibility of a bear market. Now could be an ideal time to hedge a portfolio and put options, especially on weak stocks, which could provide profits even in a bear market.